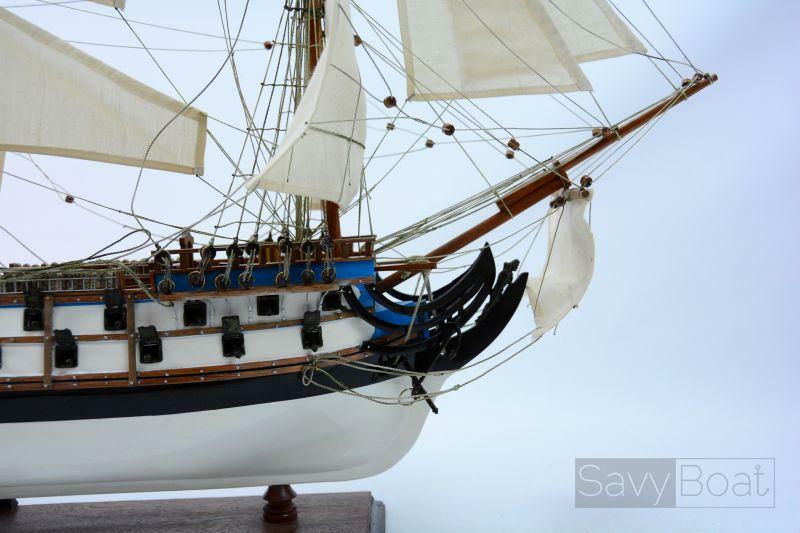 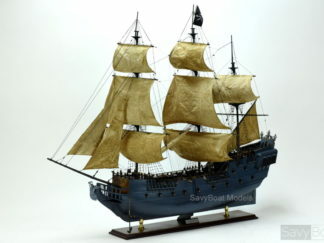 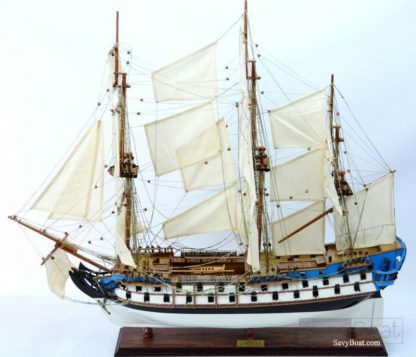 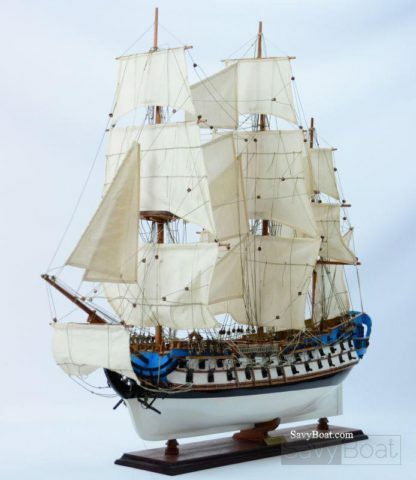 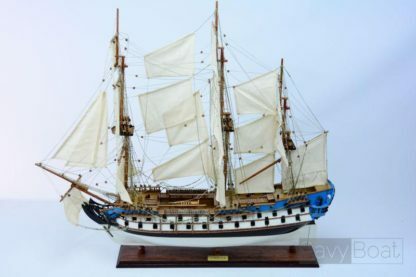 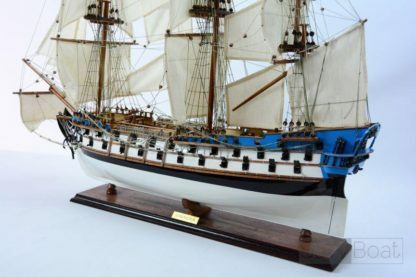 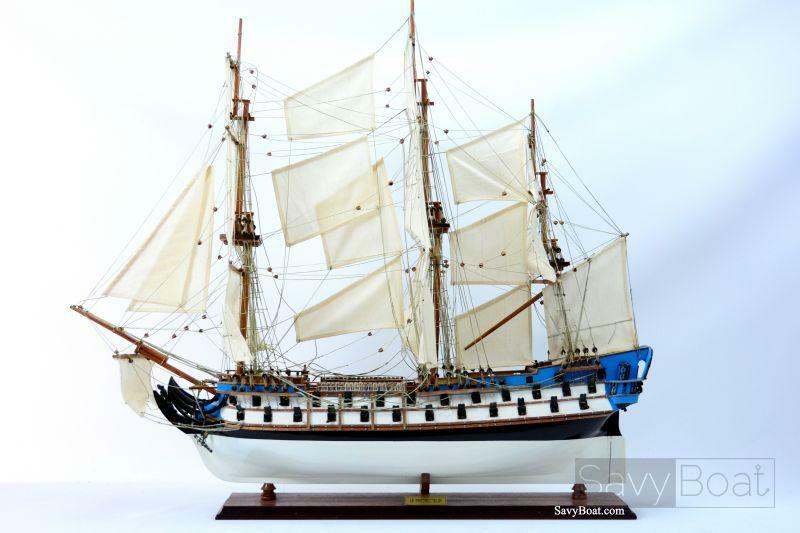 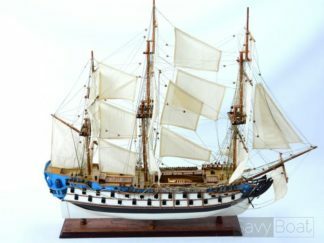 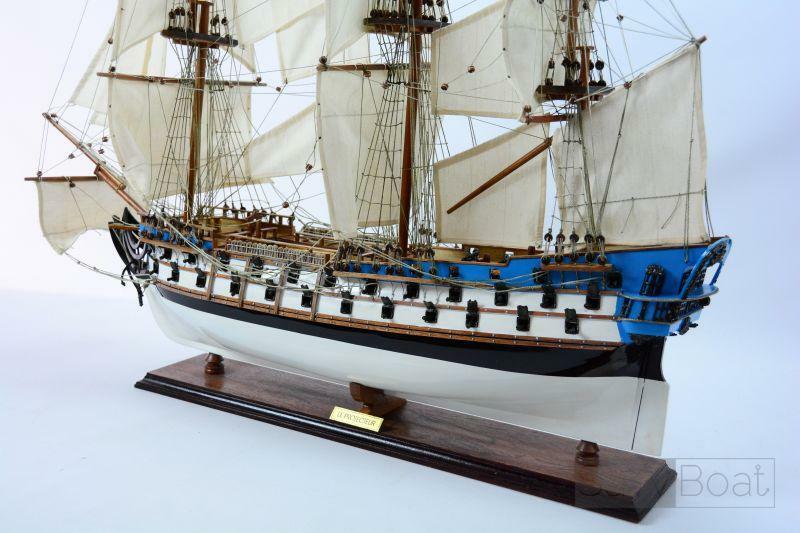 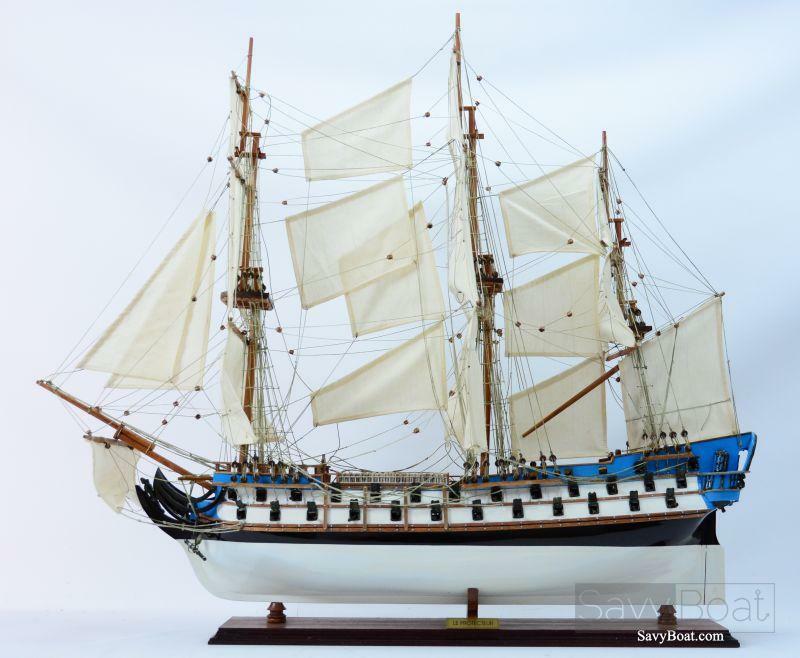 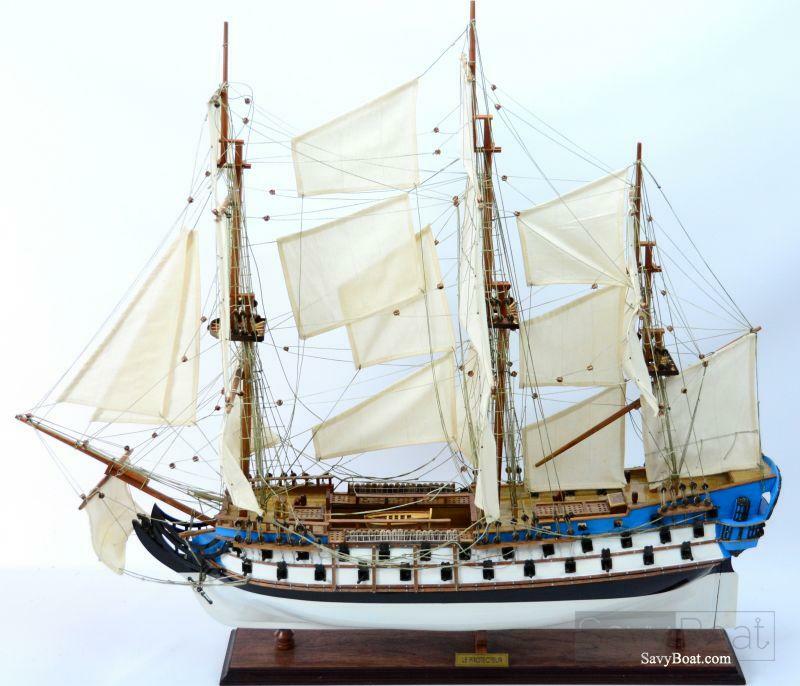 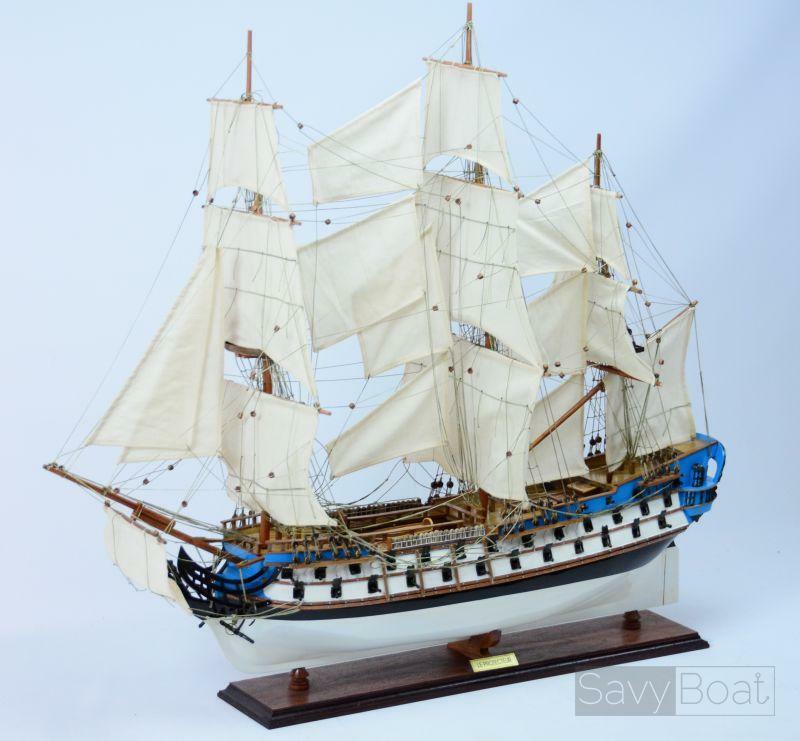 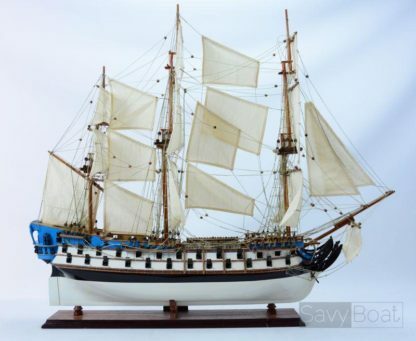 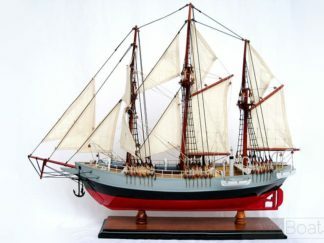 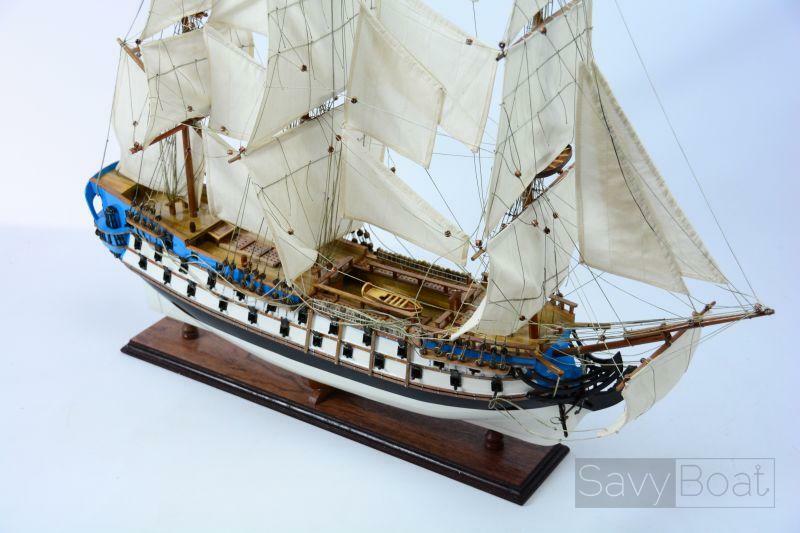 It seems that the Paris (France) ‘Musée de la Marine’ 64 gunship model had been wrongfully named by the admiral Pâris, keeper of the museum at the end of the 19th Century. 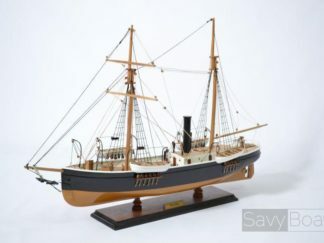 He thus christened this model with the help of a commentary written on a time register, but whithout checking the name’s truthfulness, especially regarding the ship’s armament. 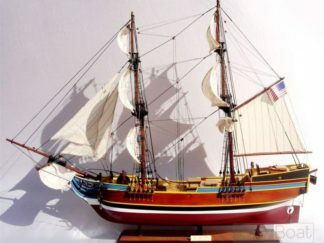 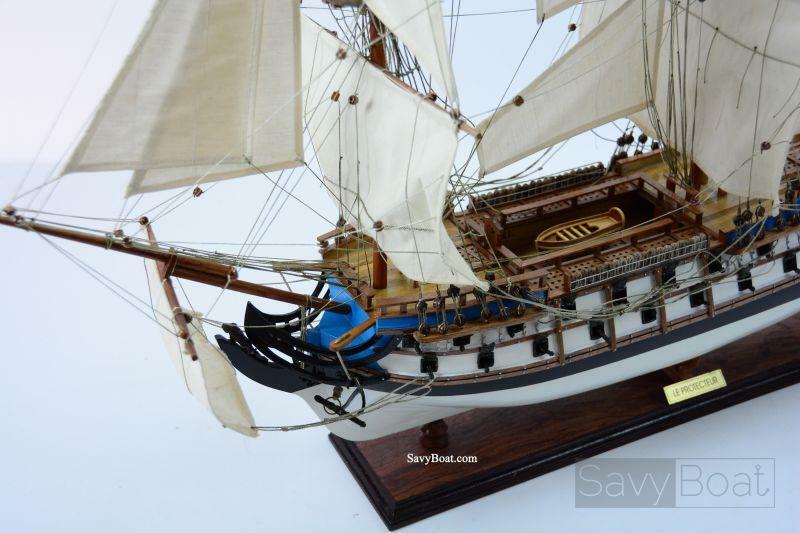 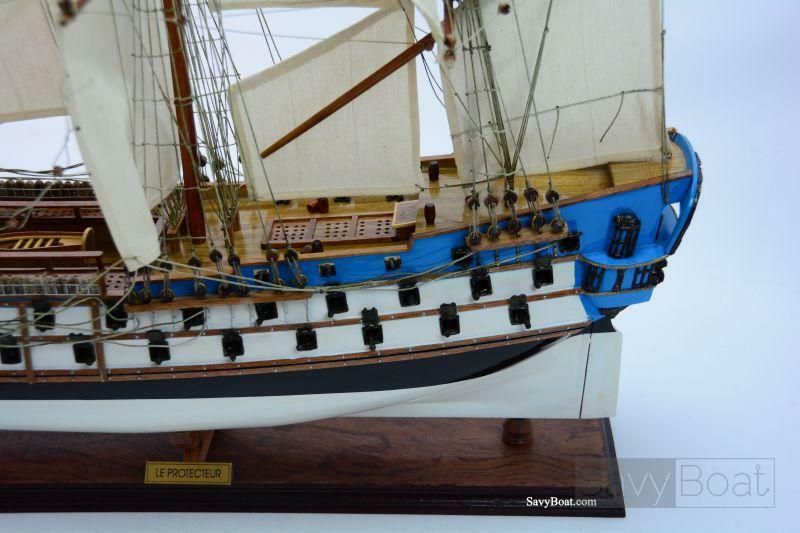 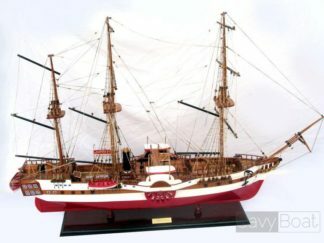 Well, a 64 gunship named Protecteur really existed; her building began under the direction of Noël POMET under the reign of the French king Louis XV, in 1757 in Toulon (harbour of the south of France), was launched on the 21st of May 1760 and sailed until 1789. She was furthermore commanded by Mr de Grasse Limermont and was part of the count of Estaing’s fleet during the Grenada campain on the 6th of July 1779. The Protecteur was armed with guns which cannonballs’ weight identify the guns : the bigger ones, placed in the first battery (the lower deck), fired 24 pounds (almost 12 kilograms) cannonballs, the 12 pounds guns threw 6 kg cannonballs, and the smaller ones, the 8 pounds guns, fired a 4 kg charge. 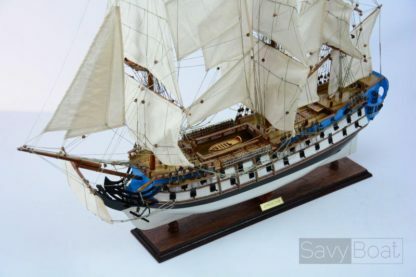 Some fifty people (often ships’ boys, hardly 12 years old) had to carry the gunpowder and the cannonballs from the magazine, in the depth of the ship. 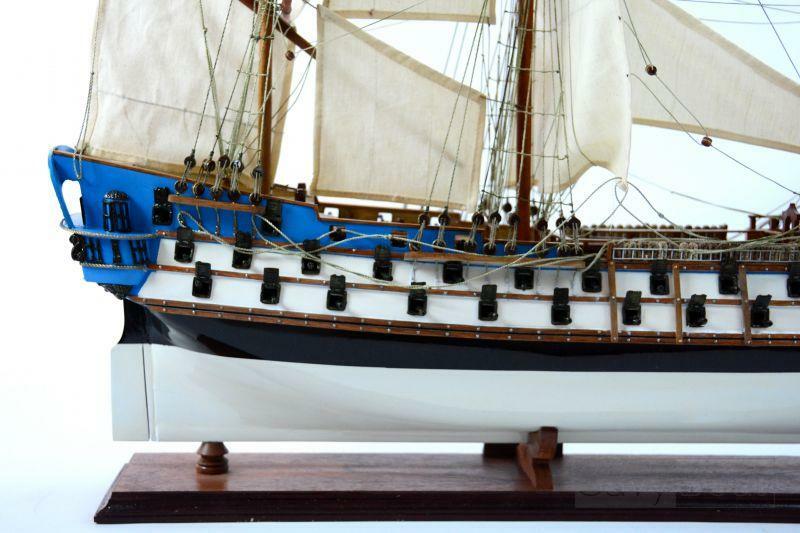 Such a promiscuity in a space so confined led to health problems that could take catastrophic proportions in no time. The ship surgeon would found himself completely cut off, and only depended on his knowledge, his implements and the famous more or less water down rum to take of all the harms that did not bound to happen during the ship’s missions. Such life conditions were endured by the crew whith the help of an iron discipline : navigation laws were implacable as far as punishments are concerned; the irons, whipping with ropes, ‘run the bowline’ (‘courir la bouline’, in French), that is to run between two lines of seamen handling ropes, or worse, the ‘hold’ punishment (‘la cale’) : let a tied on man fall in the water from the yardarm, or worst the ‘great hold’ (‘la grande cale’), where the man was pulled underneath the ship! 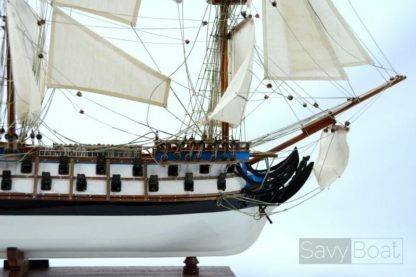 Finally the convicts would be put in prison or to death by hanging.